A double chin can cause embarrassment in social situations and a loss of self-confidence. There are numerous potential causes from this embarrassing issue, including the aging process, genetics, and weight gain. Even people who are in good shape may be dealing with a double chin; by that same token, dieting and exercise routines are not always an effective solution to the problem. Simple Kybella injections can take away the appearance of a double chin by getting rid of the excess fat in the area. 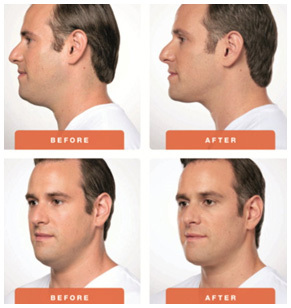 This targeted reduction brings the chin into proper proportion with the face and neck. Kybella® was approved, the only good treatment option was surgical liposuction. Now, we finally have a noninvasive method with minimal side effects and little down time. 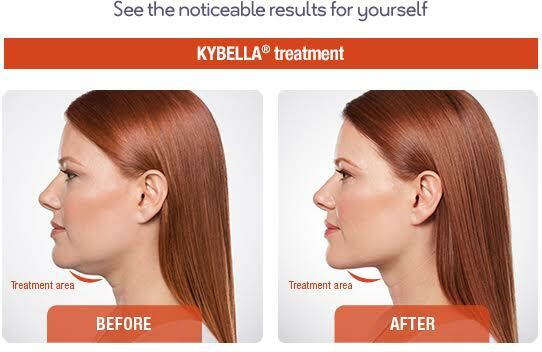 ​Kybella® is deoxycholic acid (a molecule that occurs naturally in the body) that is injected into the excess fatty tissue in the submental area. It is a “fat melter” and causes destruction of the fat cells. After treatment and during the healing process, your body’s own immune cells and natural metabolic processes clear these broken down fat cells from the area. When injected properly, it targets fat cells only and causes their destruction; all other tissue and cells remain unaffected. 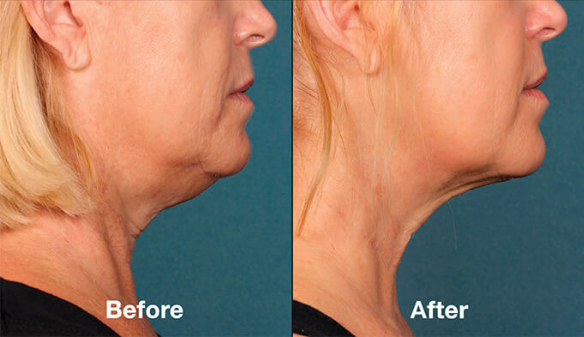 It works for mild, moderate and even severe cases of excess fat under the chin and in the upper, midline of the neck. It is not a treatment for excess fat in the sides of the neck or for the jowls. It is also not a treatment to address excess neck skin (although we have heard patients claim they think it noticeably tightened their skin). Most patients will require two or three treatments spaced 4 weeks apart; you may require more depending on the amount of fat you have in the submental area. For the right patient, this is an excellent trade off to avoid surgery. During your initial appointment for a Kybella®, we will meet and determine if treatment with Kybella® will meet your aesthetic goals, and if you are a good candidate for such a treatment. If so, we will go through a thorough history and physical examination, and discuss with you all of the different considerations that relate to treatment with Kybella®, including the schedule of injections, since Kybella® is usually not a single injection treatment. The treatment itself is remarkably quick and easy to do, and recovery and downtime is minimal. You will experience mild discomfort and a little numbness during treatment. For a few days following the injection you will experience tingling and achy feeling. It’s a great option for patients looking to improve the appearance of their neck, chin and jawline without resorting to surgery.